Buryat shaman on Olkhon Island. Russian map circa 1700, Baikal (not to scale) is at top. 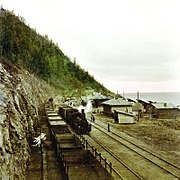 Steam locomotive on the circum-Baikal railroad. 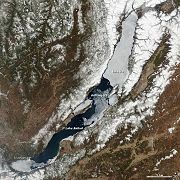 ↑ 1.0 1.1 1.2 1.3 "A new bathymetric map of Lake Baikal. MORPHOMETRIC DATA. INTAS Project 99-1669.Ghent University، Ghent، Belgium؛ Consolidated Research Group on Marine Geosciences (CRG-MG)، University of Barcelona، Spain؛ Limnological Institute of the Siberian Division of the Russian Academy of Sciences، Irkutsk، Russian Federation؛ State Science Research Navigation-Hydrographic Institute of the Ministry of Defense، St.Petersburg، Russian Federation". Ghent University، Ghent، Belgium. http://users.ugent.be/~mdbatist/intas/morphometry.htm. Retrieved on 9 July 2009. ↑ M.A. Grachev. 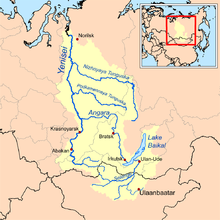 "On the present state of the ecological system of lake Baikal". Lymnological Institute، Siberian Division of the Russian Academy of Sciences. http://lin.irk.ru/grachev/eng/introduction.htm. Retrieved on 9 July 2009. ↑ 3.0 3.1 "Lake Baikal". UNESCO World Heritage Center. http://whc.unesco.org/en/list/754. Retrieved on نومبر 14، 2012. 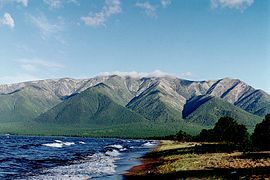 ↑ "Lake Baikal". Global Great Lakes. 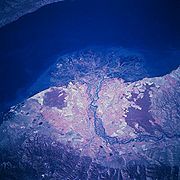 http://www.globalgreatlakes.org/baikal/. Retrieved on 23 February 2014.